We’ve come to call this one “the Peter’s Woods of the Quinte Conservation Authority”. With the exception of a small patch of fake forest right at the entrance (man planted rows of pines to control erosion back in the 1940s), the look and feel was very Peter’s Woods(ish). There were a few notable exceptions though. To the positive, the air rang with birdsong. To the negative, the trail markers (paint blotches on trees) were a bit confusing, and it was VERY BUGGY ! Take your DEET along on this one folks. I can’t blame it on the wet Spring we’ve had either. The terrain is low and wet so there are a lot of mosquitoes. Once adequately sprayed, we ventured forth. Though low and wet, we were in street shoes and fared well. The red trail showing on the trail map was wide, dry, and well maintained while the green trail was a bit wet and slippery at the bridges. Then we found … a blue trail (which doesn’t show-up on the official map). As stated above, the trail markers were confusing, and the blue trail was definitely confusing. It kinda wandered off the red trail into the bush, and it looked quite a bit rougher than the other two. It became single file and there were stretches where the markers vanished completely. There were a few stream crossings which required a bit of careful jumping. I started to feel disappointment since I was really liking this trail until it became unkempt and primitive. Then it burst out onto the well maintained red trail again, and we carried onto the green trail and looped back to the parking lot. It was a well beaten path though, and obviously well used as I could follow it without markers. Don’t get me wrong, I very much liked the blue trail. It was a pleasant walk through a wilder side of this CA. If you don’t wish to take in this different view, just stay on the red trail. Further on, we saw markers which had been painted over in other colors. So I’m guessing the blue trail is an unsanctioned or perhaps a former, abandoned trail. On the red trail as we approached the parking lot, there was another trail that had the colors blacked out. I followed it until it disappeared into a swamp so I back-tracked to the red trail and out to the parking lot. 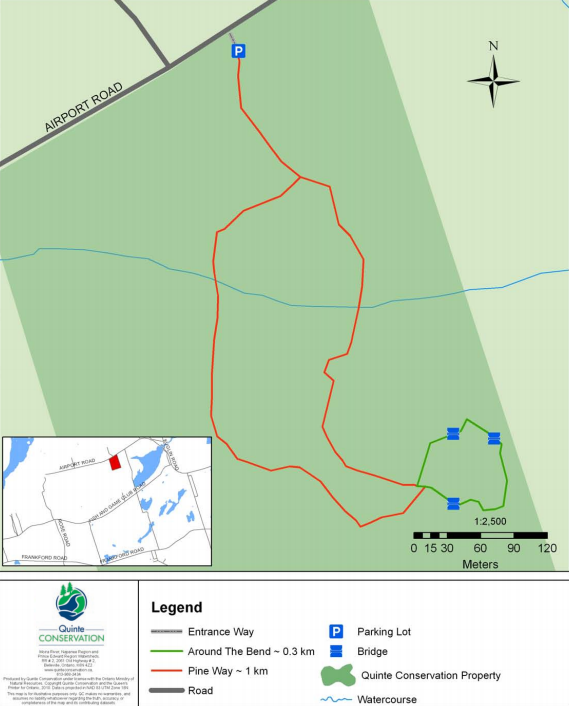 The two official trails at this CA (red and green) are wide enough for two to walk side-by-side. They’re level, well maintained and remarkably clean. There are a few streams flowing through it as well. The bridges on the green loop trail appeared to be recently built and installed, but the trail was kinda wet and muddy at the bridge crossings. For a walk on the wild(er) side, you can follow the blue trail (single file). It’s quite buggy but worth spraying yourself down for (I mean the whole CA is buggy, not just the blue trail). The plant life is impressive and I can’t remember the last time I heard so many birds singing on one trail. They’re short trails, with the red at one km and the green only 0.3 kms (we’re guessing the blue trail is about 0.5 kms). 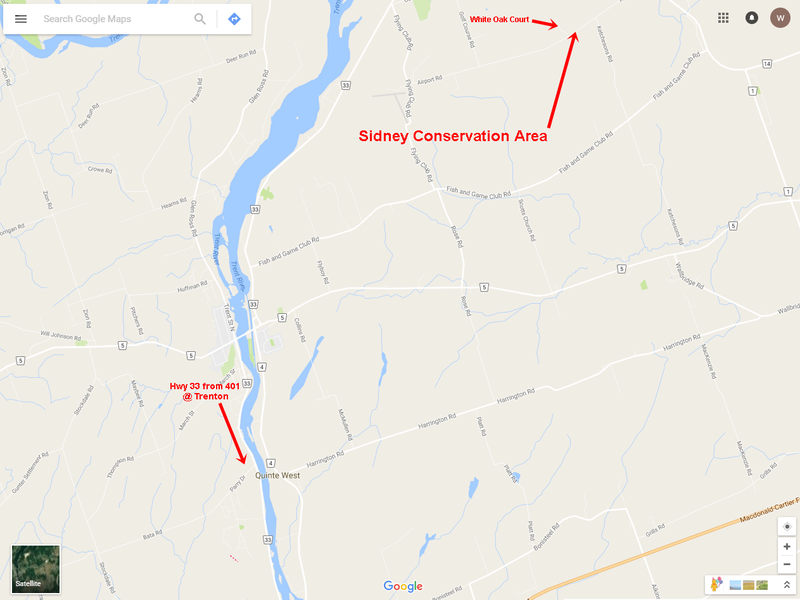 However, it’s only twenty minutes from the Bleasdell Boulder Conservation Area, which is on your way down to the 401 anyway. En route, you might see why the road is called Airport rd. Yes, there really is a Stirling airport, and it has at least five planes too. There are no facilities of any kind anywhere on the trail nor at the parking lot, and there’s no charge for usage. Check out Sagar Conservation area in the fall when it is wearing it’s coat of many colours. A bit of a cardio work out to the lookout tower but worth every bit of it. Good to hear from you. We visited Sager too late to catch the leaves back in 2013. I was surprised to see how close Sidney was to Sager without noticing it ’til last week.